What power supply unit do you recommend with this computer? I have a Pentium D dual core 3.0 ghz, An XFX 8600 GT 512 mb, 2 hard drives both western digital one is a 80 gb while the other is a 500 gb and running 1.5 gb ram... I currently have a 250 Watt power supply but it keeps getting spiked and burns out after 3/4 months of usage. So what powersupply do you recommand... show more I have a Pentium D dual core 3.0 ghz, An XFX 8600 GT 512 mb, 2 hard drives both western digital one is a 80 gb while the other is a 500 gb and running 1.5 gb ram... I currently have a 250 Watt power supply but it keeps getting spiked and burns out after 3/4 months of usage. So what powersupply do you recommand with this computer? I get about 242W so you are definitely pushing that unit pretty hard. it can handle +12@30A / 360W http://c1.neweggimages.com/NeweggImage/productimage/17-139-008-08.jpg and corsair needs no defending the quality of it's product. If you didn't know already, the +12v is the most important since both the CPU and GPU get the power from the +12v - your old 250w is probably +12v@14A / 168W max, and your system is currently straining trying to keep up. Putting your total system draw as a guideline for the +12v max is a method that ensures your system will operate within the rated power for the power supply without getting a unit that is overkill, and will last for years to come. If you anticipate any upgrades, plug them into the PSU calc and reevaluate your power requirements then lather, rinse, repeat. 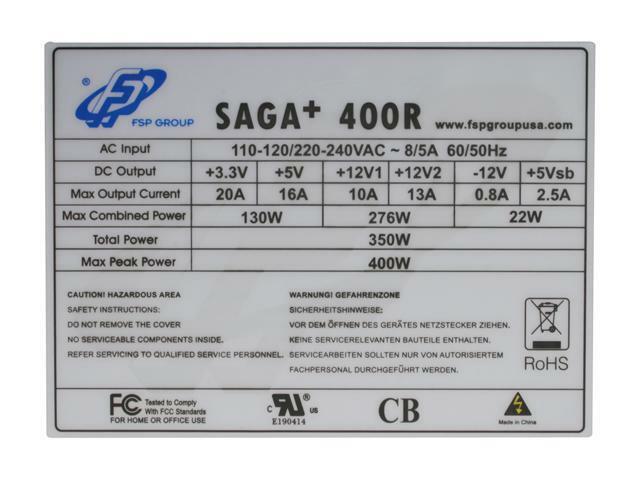 Since not all power supplies are created equal, stick with brands (or at least OEM brands) that have a good reputation, and try not to be sold on the total wattage and focus on the +12v power handling. Do yourself a favor and go 500 watts at least. Never skimp on a power supply. You never know when youre gonna add some hardware. 450 minimum. A weak power supply may also damage your motherboard. Remember as well to keep your PC cool with appropriate fans, and clean of dust. 500W would be sufficient... But if you plan on upgrading anytime soon go 650 or better. The higher the wattage, the more stable your system will be.